With the addition of double-channel ABS, Yamaha’s Fazer 25 has seen a price bump to Rs 1.43 lakh, ex-showroom Delhi. You have to shell out Rs 14,000 more for the safety aid while the non-ABS model will continue to sell until stocks last. There are two new colours for the Fazer 25: dark matte blue and metallic black. Yamaha Fazer 25 prices start at Rs. 1.30 lakh (Ex-Showroom). 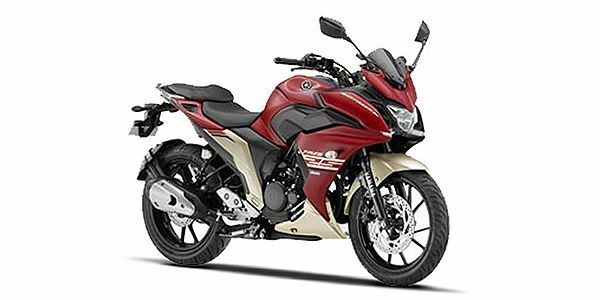 Yamaha Fazer 25 is available in 2 variants and 2 colours. Share your experiences with Fazer 25? The claimed ARAI mileage for the Yamaha Fazer 25 petrol is 41 kmpl. Q. Which bike is best between FZ 25 ABS and Fazer 25 ABS? Q. I want buy new bike but I'm confused which is better one YZF R15 V3 vs Yamaha Fazer 25? Q. Please advice if it is comfortable for riding with 7 year boy and ladies, I mean I want to travel with my family around 60 to 70 km daily, is this confortable for 3 person? I bought TVS apache 4V carb version 25 days ago. It gives mileage of 42.4 kmpl and to check performance you better go to showrooms for both bike and take a test drive. Q. How is the mileage when compared to FZ SFI model? The Fazer 25 is a tourer based on the FZ 25. The Fazer 25 uses the FZ 25’s underpinnings and bodywork with the addition of a full fairing. The new fairing is well-integrated into the body work and looks good when viewed from the side though the front could have been designed better. The bike gets two two-tone colour options. The feature list is similar to the FZ 25 though the Fazer gets an extra horn. It gets LED headlamp with DRL’s integrated into the fairing, fully digital instrument console and a floating flyscreen. The Fazer 25 carries forward the same underpinnings of the FZ 25. Power is courtesy a 249cc air and oil-cooled fuel-injected single-cylinder motor. Output is 20.9PS at 8000rpm and 20Nm of torque at 6000rpm. Performance and dynamics is expected to be slightly duller than the FZ 25 as the Fazer 25 weighs 6kgs more. Nevertheless we expect the bike to perform well at low revs thanks to the short gearing. The motor is refined though the engine would feel strained at touring speeds due to its shorter gearing. Suspension includes telescopic front forks and linked rear monoshock. Braking is via disc brakes at the front and rear. Bajaj Pulsar RS 200: The Pulsar RS 200 is a 200cc faired sports bike. Its sportiness comes in the form of a perimeter frame and gas charged rear monoshock that makes the RS 200 a hoot around corners. The bike gets twin projector headlamps and LED tail lamps and indicators. Power comes courtesy a 199.5cc liquid cooled and fuel injected single that makes 24.5PS at 9750rpm and 18.6Nm of torque at 8000rpm. The RS 200 is priced at Rs 1,21,894 (ex-showroom Delhi). The ABS version retails for RS 1.33.747. The Yamaha Fazer 25 fills in the shoes of the now discontinued Hero Karizma series. It serves up as a good alternative for those looking for a substantially large bike without spending a bomb on it. The Fazer 25 should be comfortable and perform well in the city though the short gearing makes it unsuitable for touring. The Pulsar RS 200 offers better value though, offering more kit for Rs 8,000 less. The fully-faired version of the FZ25, the Fazer 25, has just made its Indian debut. We compare it with its Indian rival, the Bajaj Pulsar RS200, to see how it scores on the specifications front. A beautiful machine , with the reliability of Yamaha . Confused about Yamaha Fazer 250?